I know the last time I talked about this piece was back in February. I have sort of been working on it, though there have been long stretches where I have not worked on it. I got a little fed up because sewing big sections to the big main piece is really a pain and I didn’t want to do it. It made me think twice about La Passacaglia, but that is a tale for another day. Finally, I put a new section on and it is looking good. A little boring and staid, but good. 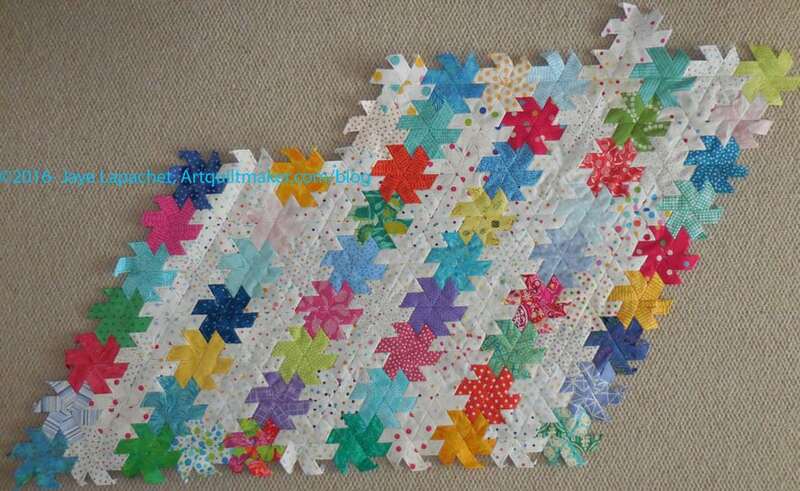 I am going to try to put one or two stars on the main piece instead of larger secondary pieces. It means more handling of the large piece, but perhaps the duration of dealing with the main section will be less. Nice! How large do you plan to go? Bed sized, though I want to start La Passacaglia, so I am rethinking this piece. I do enjoy EPP. I bought it at QuiltCon from QuiltMania. There is a copy on Amazon for $25. Wow, it was not there when I was looking, thanks!